FUR IS FOR NONHUMAN ANIMALS! August 28, 2014 14:28 / 4 Comments on FUR IS FOR NONHUMAN ANIMALS! DOMESTICATED CATS ARE ALSO SKINNED FOR THEIR FUR. THIS IS OFTEN JUST FOR A PIECE OF SENSELESS TRIMMING! THIS MESSAGE APPLIES TO ALL SPECIES. August 27, 2014 14:16 / 12 Comments on JOB SATISFACTION?? I find this photograph distressing and if you are following this blog you probably do as well. However, for this woman it seems like “business as usual”. I wonder, though, how killing and skinning sentient beings all day for a trivial fashion item affects a person’s psyche? August 24, 2014 12:48 / 8 Comments on BREAKING NEWS! My anti-fur campaign has been reported in the news, as seen below. Cape Town – There has been a heated response to Fin24’s article Fur fury over Investec tenant, with users on both sides of the fence sending in their comments thick and fast. Animal activist Dr Margaret Wilhelm has been concerned with landlord Investec’s lack of engagement over the issue of its tenant, fur retailer Robert Fischer of Erich Fischer Furriers, in the Firs Shopping Centre in Rosebank, Johannesburg. Investec, with its zebra logo, claims excellent business ethics and stresses its commitment to society, the environment and preservation of animals,” said Wilhelm. “It is, therefore, an anomaly that Investec profits from the fur business through its lease.”Read: Fur fury over Investec tenant. Most of the comments have been squarely on the side of the animal rights activists. Says Fin24 user Clairwyn: “OA label or not, there is no such thing as humane killing. That goes as much for killing a cow or pig for its meat, shooting a lion for a trophy or skinning a seal, chinchilla or cat (quite common, apparently) for its fur.”She argues that fur is a luxury item, and that people who wear it “can’t even use the excuse that they are hungry”. They are also fully aware that “an animal, or more likely many animals, died for their whims”.Addressing the owner of Erich Fischer Furriers, she said there must be a more compassionate way to make a living. Winnie also weighs in on the part of the animal rights activists. She says: “What a revolting, barbaric industry the fur trade is. I have personally seen a video clip from China as to how they skin the animals ALIVE for their fur, as it comes off easier this way. Pam raises the matter of ethics: “I do believe it is a very amoral thing to use the skin of animals for clothing of humans. Besides that, the farms where these animals live are in many times very bad places for animals. User Anastasia was appalled to discover the location of Fischer’s shop: “I am an animal lover and would like to state that I am horrified that such a shop exists so close to where I live! I am completely against the fur trade! “How anyone can make a living off the pain of another living being is beyond comprehension. There are not enough decent adjectives to describe how I feel about this. But not everyone agrees. Although in the minority, there are some who feel fur is a trivial issue compared to more pressing global issues. Tanja also makes no secret of her stance. She says: “I’m with Fischer all the way. The market for fur in SA is minute, but if customers want to buy fur, let them.” She feels it is unfair to “victimise the last remaining fur trader in Africa”, and says “Investec shouldn’t bow to the pressure”. Another anonymous user writes: “It’s amazing how we go on and on about fur when the same people eat beef, mutton and chicken. Those animals get killed as well for consumption by human kind. “If those ‘activists’ are for animals not being killed, I would expect them to be vegetarians but I doubt 10% of them are vegetarians. If you would like to add your comment, please click on this link to access the article. When I read the article below it gave me hope for humanity. SAN DIEGO (Reuters) – Hollywood mogul and co-creator of The Simpsons, Sam Simon, has bought a chinchilla farm in Southern California as part of a drive by animal rights activists to close the breeding facility. In what all parties described as a “win-win” deal, 90-year-old owner Lurlie Adams was able to offload the farm she did not want any more to Simon for $50,000. And the 425 chinchillas were moved to much larger cages while awaiting adoption. The San Diego Humane Society also received a $100,000 donation from Simon to care for the furry animals, which will be offered to new homes at a cost of $25 each. Activist group People for the Ethical Treatment of Animals, which helped broker Tuesday’s sale behind the scenes, hailed the closure of one of California’s largest breeders of chinchillas. PETA Senior Vice President Lisa Lange said Adams, who had been trying to sell the farm for three years, signed a contract saying the land will never again be used to rear the animals. Adams and her husband opened the Valley View Ranch in Vista, about 25 miles (40 km) north of San Diego, in 1966 after answering an ad that said they could be millionaires if they raised chinchillas. She said she was unaware PETA were involved until the sale went through. “I didn’t find out until today … that they’re shutting it down and adopting the animals out,” she said on Tuesday. Simon, whose portfolio also includes Emmy awards for his work on Taxi, Cheers, The Garry Shandling Show and a half dozen other projects, was diagnosed with metastasized colorectal cancer in 2012. He has long been active in philanthropy and is particularly keen on causes that involve children and animals. In June he rescued Sunder, an Indian elephant that had been shackled in a temple in India, beaten and starved. Before that, he paid for the rescue and relocation of bears in the U.S. state of Georgia. The chinchillas were taken to the Oceanside and San Diego humane society branches to be readied for adoption. Some of the accused outside the court. STICK UP FOR BUMPER STICKERS! August 6, 2014 15:17 / 6 Comments on STICK UP FOR BUMPER STICKERS! ~ A bumper sticker is an adhesive label or sticker with a message, intended to be attached to the bumper of an automobile and to be read by the occupants of other vehicles (Wikipedia, the free encyclopedia). ~ STICK UP means to stand up for somebody or something. This was not my experience in my recent bumper sticker campaign. http://www.furkills.co.za – Get the facts about the fur industry before spending your money. As part of our anti-fur campaign I thought it a good idea to give BUMPER STICKERS, as above, to people sympathetic to our cause. I was so enthusiastic that I paid for 1 500 stickers and was ready to print more! Clearly I have been living in a fur-free cave for the past few decades, as bumper stickers are no longer popular. Some responses were, ‘I don’t do bumper stickers’, ‘No, not on my car’ and ‘I don’t have a bumper’. 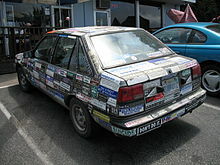 Many years ago when I used to drive to university, bumper stickers were spotted on just about every car, similar to this arbitrary car below. For some reason only known to the universe I would regularly find myself behind a student car with the following bumper sticker slogan. To this day I am not sure what this slogan means. I have a strong feeling, though, that it has nothing to do with whales but is sexist and offensive to women. Of course what would really save the whales is if people stopped killing them! However, the good news is that I persuaded some people to stick the bumper stickers anywhere, including on the back of public toilet doors where there is briefly a captive audience. August 3, 2014 13:52 / 18 Comments on NO JUSTIFICATION!